These little Peruvian girls have to be the best dressed farm workers in the world. Most of us don’t work a garden patch this well-attired. 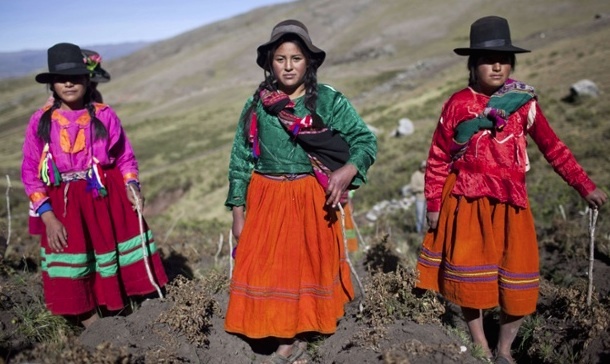 They’re helping harvest potatoes in the Apurímac region of the Andes. Many think the potato originated in Ireland & Europe but in fact it originated in parts of present-day Peru & Bolivia. Peru is the country with the greatest variety of potatoes in the world, with 3,800 types, but China is now the world’s largest potato-producing country & nearly a third of the world’s spuds are harvested in China & India. Jack Weatherford, now a retired professor from Macalester College in Minnesota, has written several popular histories of the considerable achievements of Native Americans & not just in agriculture but in fabrics & governmental forms. In the piracy so common to supremacy, many of these achievements were claimed by European conquerors. Weatherford’s books are well worth reading, most notably “Indian Givers: How the Indians of the Americas Transformed the World”, because he shows how the development of European industry & capitalism was completely dependent on plunder & pirating the achievements of Native Americans.